On Wednesday, Rep. Jesús “Chuy” García (IL-04), and his colleagues Reps. José E. Serrano (NY-15), Suzanne Bonamici (OR-01), Donald S. Beyer Jr. (VA-08), Pramila Jayapal (WA-07), led by Rep. Adriano Espaillat (NY-13) introduced a legislative package to protect immigrant rights. “Last night, President Trump had an opportunity to bring our nation together, but instead, he chose to continue pandering to his base, sowing fear and criminalizing an entire community. Instead of proposing sound solutions for the immigration challenges our country faces, he focused a non-existent border crisis. My colleagues and I are introducing this package of three bills that will protect immigrants and their families, and hold the Trump administration accountable. “Immigrant families, including those in my district, deserve to live and walk in their neighborhoods without the fear of being detained and deported at school, places of worship or the doctor’s office. We will require that families separated at the border be reunified immediately, receive legal counsel and will require that parents are updated about their children until they are reunited. Finally, we should hold ICE and CBP agents accountable by requiring them to wear body cameras to protect the civil and human rights of the immigrants they arrest and detain. The three legislative proposals we are introducing today will address very important problems created by Trump’s inhumane polices,” said Rep. Jesús “Chuy” García. 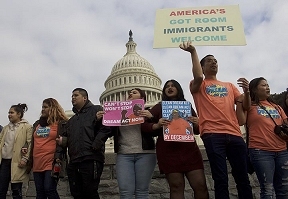 The bills, which were first introduced in 2017 and 2018, seek to prevent some of the Trump Administration’s most egregious immigration enforcement tactics and protect the rights of immigrants in the United States. 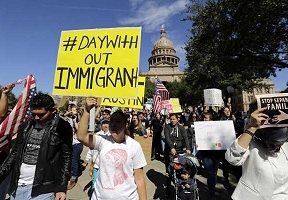 One of the bills, the Protecting Sensitive Locations Act, will prohibit immigration enforcement in certain “sensitive locations” such as courthouses, schools, community centers and houses of worship, a tactic for targeting vulnerable immigrant communities that has become common under the Trump Administration. Another measure, the Reunite Every Unaccompanied Newborn Infant Toddler and Other Children Expeditiously (REUNITE) Act, would require the immediate reunification of children who were separated from their parent or legal guardian as a result of the administration’s “zero tolerance” policy. Finally, the ICE and CBP Body Camera Accountability Act would require Immigration and Customs Enforcement and Customs and Border Patrol officers to wear body cameras and would make footage available for any legal proceedings.